In the study, Dr. Yassen and colleagues at Menoufia University in Shibin El Kom, Egypt, sought to test agreement between two brain function monitoring indices, Masimo PSi and Medtronic BIS. They monitored 60 patients in 4 sub-groups: with healthy livers undergoing hepatotomy (15 PSi, 15 BIS) and with cirrhotic livers undergoing resection (15 PSi, 15 BIS). Sensors for both technologies were simultaneously applied and anesthetists monitoring PSi were blinded to BIS results and vice versa. To measure the level of interference from electrocautery on each index, the researchers noted whether BIS and PSi values were present (displayed) or absent each time the electrocautery unit was activated. The researchers found “An excellent degree of reliability between PSi and BIS at all measuring points.” With 804 data pairs total, they calculated an overall intra-class correlation of 0.92 (95% confidence interval of 0.91-0.93, p<0.001). Using Bland-Altman analysis, they calculated overall mean bias difference of 2.19 (95% confidence interval of 1.40-2.98, p<0.0001). PSi-guided and BIS-guided sevoflurane consumption were similar: 65.67ml+/-31.60ml and 68.47ml+/-27.63ml respectively, p=0.983. SedLine brain function monitoring helps clinicians monitor the state of the brain under anesthesia with bilateral acquisition and processing of four leads of electroencephalogram (EEG) signals. Next Generation SedLine, now available worldwide, features an enhanced PSi with less susceptibility to EMG interference and improved performance in low power EEG cases, as well as an enhanced Multitaper Density Spectral Array (DSA). Yassen K, Elsheikh M, Helal S, Badawy E, and Metwally A. Patient State Index versus Bispectral Index in cirrhotic patients and non-cirrhotics undergoing hepatic resection: A controlled randomized study. Proceedings from Euroanaesthesia 2018, Copenhagen, Denmark. #1167. This press release includes forward-looking statements as defined in Section 27A of the Securities Act of 1933 and Section 21E of the Securities Exchange Act of 1934, in connection with the Private Securities Litigation Reform Act of 1995. These forward-looking statements include, among others, statements regarding the potential effectiveness of Masimo SedLine® and PSi. These forward-looking statements are based on current expectations about future events affecting us and are subject to risks and uncertainties, all of which are difficult to predict and many of which are beyond our control and could cause our actual results to differ materially and adversely from those expressed in our forward-looking statements as a result of various risk factors, including, but not limited to: risks related to our assumptions regarding the repeatability of clinical results; risks related to our belief that Masimo's unique noninvasive measurement technologies, including Masimo SedLine and PSi, contribute to positive clinical outcomes and patient safety; risks related to our belief that Masimo noninvasive medical breakthroughs provide cost-effective solutions and unique advantages; as well as other factors discussed in the "Risk Factors" section of our most recent reports filed with the Securities and Exchange Commission ("SEC"), which may be obtained for free at the SEC's website at www.sec.gov. Although we believe that the expectations reflected in our forward-looking statements are reasonable, we do not know whether our expectations will prove correct. All forward-looking statements included in this press release are expressly qualified in their entirety by the foregoing cautionary statements. You are cautioned not to place undue reliance on these forward-looking statements, which speak only as of today's date. We do not undertake any obligation to update, amend or clarify these statements or the "Risk Factors" contained in our most recent reports filed with the SEC, whether as a result of new information, future events or otherwise, except as may be required under the applicable securities laws. 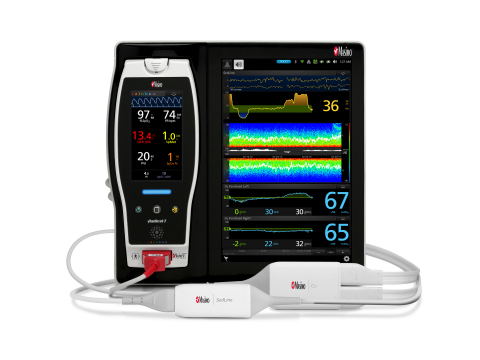 Masimo announced an abstract comparing Patient State Index (PSi), part of SedLine® brain function monitoring, to Medtronic Bispectral Index (BIS™).